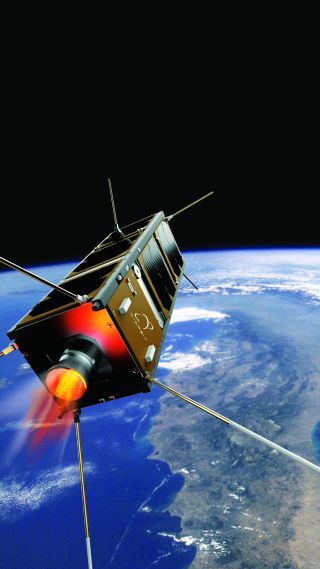 Artist's illustration of the D-Sat cubesat in Earth orbit. A tiny satellite that reached orbit last week will make history when it comes back down to Earth later this summer. The D-Sat cubesat, which was developed by Milan-based startup D-Orbit, soared into space atop India's PSLV rocket on June 23. D-Sat is fitted with an independent thruster system known as the D-Orbit Decommissioning Device (D3), which is designed to help mitigate the growing space-junk problem. "We have developed a decommissioning system for satellites," D-Orbit CEO and co-founder Luca Rossettini told Space.com. "It's an intelligent motor that you install on satellites before launch and it enables the satellite to be removed at the end of life in a very quick and controlled way." D-Sat's purpose is to demonstrate the technology, with the aim of inspiring commercial satellite manufacturers and operators to consider it for their missions. "The decommissioning is not just a maneuver," said D-Orbit co-founder and chief commercial officer Renato Panesi. "There are several operations that must be completed in a precise sequence. Each one of these operations is a single milestone in space. Many things can go wrong." Holger Krag, who leads the European Space Agency's (ESA) Space Debris Office, praised D-Orbit for its work and said such technology has an important role in the future of spaceflight, if the space around the Earth is to stay safe and usable in the long term. Current international guidelines recommend that satellite operators de-orbit their satellites within 25 years from the end of operation, but many consider this timeframe to be too long. The amount of space junk is increasing, and every defunct satellite left in orbit is a risk; this material not only threatens operational spacecraft but could also be hit by existing pieces of debris, potentially spawning large clouds of dangerous fragments, experts say. The D-Orbit team, which is already in talks with several major satellite manufacturers in Europe, believes that the technology will not increase the overall cost of satellite missions, as it will allow operators to use up all the fuel aboard their satellites and thus keep the craft operational for longer periods of time. "The satellites can use the full amount of propellant that they have in the tanks to extend the life, instead of wasting the fuel trying to remove the satellite with the onboard propulsion system that is not designed to accomplish such an orbital maneuver," Rossettini said. According to Rossettini, the decommissioning device is scalable and could in the future be implemented on satellites of up to 6.6 tons (6 metric tons) of mass orbiting at various altitudes. D-Sat, a tiny satellite developed by Italian startup D-Orbit, launched to Earth orbit on June 23, 2017, on a mission test out technology designed to de-orbit spacecraft. Panesi said that, for example, an 880-lb. (400 kilograms) satellite orbiting at an altitude of 750 miles (1,200 kilometers) would take several weeks to de-orbit with the D3 device. For comparison, the company OneWeb, which will start deploying its mega-constellation of 800 satellites next year, plans to de-orbit their craft within a five-year period after decommissioning. "Sometimes customers may only request in-orbit clearance, which means lowering the altitude of the satellite at the end of life," said Panesi. "In this case we don't need to perform a complete re-entry but just lower the altitude to 200 or 300 kilometers [125 to 185 miles], and then the satellite would be decommissioned through natural decay." In the case of geostationary satellites, D-Orbit representatives said, the D3 device could be used to push the defunct craft to the "graveyard orbit" several hundred kilometers above the congested geostationary ring — the area about 22,300 miles (36,000 km) above Earth's surface where the speed of orbiting satellites matches the velocity of the planet's rotation. During its suicidal maneuver, D-Sat will be transmitting data from two other experimental payloads. The first of them is the Atmosphere Analyzer, designed to gather information about the lower ionosphere, the part of Earth's atmosphere that is too high for high-altitude balloons to sample but too low for remote-sensing satellites to reach. The analyzer will collect data as the cubesat descends all the way to its disintegration at the altitude of 50 miles (80 km). The second experiment, DeCas, is essentially a single fragment of the satellite designed to survive the longest. The element will transmit data after the rest of the cubesat burns up, allowing ground-based teams to understand the debris footprint of the satellite. Such information could help assess the risk from space debris to airplanes travelling in the area where a satellite is being de-orbited as well, as the possibility of a fragment causing damage on Earth, D-Orbit representatives said.